Shine a Light: Enjoying Hobart in our new (?) car! 'Tree Hugging' one of the massive eucalyptus trees on Mt Wellington. There is so much to do in and around Hobart. It's a lovely small city with a mixture of Australian history and the very, and in some cases very quirky, new. There are natural wonders on land and sea most within a days drive of our little marina. We've just started to explore the immediate surrounds and find our way around the city waterfront. We're staying at the Prince of Wales Bay Marina which is a good place for the boat - peaceful and reasonably protected from the weather - but not such a good place for travelling yachties wanting to get around and see the sights. Why? Because it's smack in the middle of an industrial area with no public transport and Hobart central about 6 km away. On Monday George wanted to change the engine oil. After much research he found that we should be able to buy the brand/weight we needed in a little suburb that should be an OK walk from the marina. So off we went. Normally the need to walk places from a marina is a joy ... usually it's an enjoyable 20 minutes into town or to a bus stop. Not here. We walked and walked .. through the industrial area, across a main highway, and on through the next suburb. Unfortunately my foot seemed to happily undertake the first 20 minutes but when it becomes 30, then 40 then 50 minutes it starts to really hurt. We found the shop George thought he could purchase the right oil at but they didn't have the right stuff (I did suggest we call first but was told that would not be necessary - Men!). Of course they suggested we could find what we were looking for at another shop but it was at least another 20-45 minutes walk away. As we were standing on the pavement "discussing" what to do next George noticed a tiny El-cheapo car yard on the corner. "Let's have a quick look around", he said. Actually buying a car had never crossed my mind but George was considering the possibility. Ian, on 'Bogart', had tried to rent a car and most places were all rented out with the exception of one 'rent a wreck' place where he managed to get a car for 3 weeks. Since we are planning on being down here until March - and use the POW Bay Marina for a base - we were going to need a car. My foot said so. Anyway, after negotiations were held and we - according to George - did the obligatory walk away .. we bought a car. A 1995 Mitsubishi Magna in great shape and with well over 300,000 km on it! The price tag was $1,695 and George got it for us for the reasonable sum of $1,500. Plus, the guy at the yard said he would buy it back from us when we left ... bargain. Our car. We now have wheels! Freedom!!! A boat for exploring by sea and wheels to explore the land. Excellent. Yesterday Bruce was picking up the rental car he had booked to cruise around (smart to book) and he moved to the B & B he would be staying in until he went home to Canberra. We drove him into town to find his new digs and decided to drive up to the top of Mt. Wellington to check out the view of Hobart from the top. Mt Wellington rises up behind Hobart and stands as an impressive stone citadel above the city. It towers there, above all, and so massive it even affects the weather for those below. The view of Mt Wellington from our boat in the marina. Often clouds obstruct the summit and it snows at the top even in summer. On our way up to the summit of the mountain we stopped in the little hamlet of Fern Gully to have lunch at the tavern. The sky was clear when we went in. Cute and very welcoming tavern halfway up the mountain. But by the time we came out from lunch the clouds had started to roll in and become quite thick. It was clear we wouldn't be able to even see the road the rest of the way up the mountain much less the view once we got there. We noticed across the street from the tavern there was a little park and the beginnings of a walking track .. we decided to have a closer look since we weren't going any further today. It was a good find. Up the track were, we both thought, the tallest trees we had ever seen ... their tops were hidden way up in the gathering mist. Ancient eucalyptus standing extremely tall on the mountain .. magnificent to see. As we drove back to the marina the weather continued to close in and by the time we made it back to the boat the heavens were ready to open in an all afternoon grey and blustery downpour. 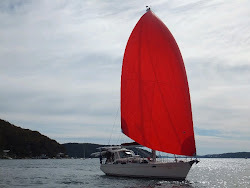 About 6pm Peter and Sue on Celay finally came around the bend and joined Bogart and Southern Belle here in the marina. They left Sydney about a week after us and, after a wait for a good sailing weather window, they made great time to Hobart. Me, George and Ian were there at their berth to welcome them and help with their mooring lines. That's one of the absolute BEST experiences in this cruising thing! To arrive tired, with a feeling of happiness & relief at being almost at your destination, and see friends there waiting to help get you that final few feet into the berth and secured. Once all moored, with hugs and smiles and immediate stories all round the three of us went aboard for drinks and more tales of the crossing. After showers Peter & Sue came to our boat for a quick dinner before a well earned rest. Today we did food shopping for Christmas Day and Boxing Day .. although none of us feels particularly in a Chrissy mood. We then went to a little restaurant deli in North Hobart with Peter, Sue and their son Robert and his girlfriend. Tonight, for a change, it will be just George and me .. a quick dinner and then off to bed with a good book! What a great journey to experience Hobart. i hope that you find all the happiness you deserve. My wife and I are taking a trip soon so this really gets me excited for things to come. We have been so busy over the last several months it will do us good taking a breather and exploring our beautiful country. Thanks.